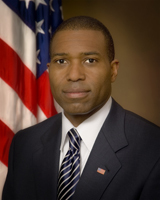 Assistant Attorney General Tony West will be on hand at a FTC news conference Wednesday in Washington, D.C. Still pushing work-at-home schemes on the Internet? The Federal Trade Commission has a message for you. On Wednesday, the FTC will announce a major “law enforcement sweep cracking down on job and work-at-home fraud fueled by the economic downturn,” the agency said. Investigators will release “[s]till shots from the Web sites of some of the operators charged in this law enforcement sweep,” as well as a consumer-protection video. The FTC disclosed few details about the sweep, but it is known that officials from the the U.S. Department of Justice and the U.S. Postal Inspection Service will attend the news conference. Speaking on behalf of the Justice Department will be Assistant Attorney General Tony West of the Civil Division. West was appointed to the post by President Obama in January 2009. Ohio Attorney General Richard Cordray also will be present at the news conference. West, a law-enforcement veteran knowledgeable about high-tech crimes, is a graduate of both Harvard and Stanford . He has served as a prosecutor on both the state and federal levels, including a five-year stint as an Assistant U.S. Attorney for the Northern District of California. As a state Special Assistant Attorney General, West advised former California Attorney General Bill Lockyer on high-tech crime, identity theft, antitrust litigation, civil rights, police-officer training and police misconduct. Although the FTC did not release specific details about the crackdown, work-at-home schemes come in many forms. Fraudsters, for example, often use high-traffic Internet sites operated by famous companies to post “job” listings for jobs that don’t actually exist. In some instances, the “jobs” have proven to be multilevel-marketing “opportunities” in which participants must pay a fee to become a sales rep and to recruit others for a chance to increase “earnings.” In other cases, the “jobs” have proven to be scams such as stuffing envelopes, entering data and labeling postcards. Such scams frequently target people of limited means. â€œWork-at-home scams prey on some of the most vulnerable in our society â€” the economically disadvantaged, the unemployed, the disabled, and the elderly â€” who are trying to supplement their income by working from home,â€ U.S. Attorney Preet Bharara said earlier this month. Bharara is U.S. Attorney for the Southern District Of New York. On Feb. 3, Bharara and postal inspectors announced the arrests of Philip Pestrichello, 38, and his wife, Rosalie Florie, also 38, in a work-at-home scheme that operated in New Jersey. Participants further were told “Our company has a rock-solid reputation,” prosecutors said. A check revealed that Pestrichello had spent three years in federal prison for operating a previous scheme and had repeated run-ins with regulators dating back to the early 1990s. It will be interesting to see just “whose still shots” will be shown at the press conference. I bet Narc That Car and DNA are shaking in their collective boots. Wouldn’t it be fitting if they were shown. Sure would take the sails out of their “recruiting.” At least one can hope they are two of the “lucky ones” selected. I tend to think Narc that Car and DNA etc… are a little too fresh for this, but I do have my fingers crossed for Jake Amedee, Faith Sloan, Ken Russo and a few other serial HYIP/Autosurf pimps. The many variations of the ‘google profits’ scam. Gregg Evans: I tend to think Narc that Car and DNA etcâ€¦ area little too fresh for this, but I do have my fingers crossed for Jake Amedee, Faith Sloan, Ken Russo and a few other serial HYIP/Autosurf pimps. We couldnt get that lucky. Hopefully they will show the ASA forum and the other ponzi forums. If it’s not a HYIP or an autosurf, wait for some of the promoters to jump up and claim that as an endorsement from the FTC etc…. A new team is being created to tackle online fraudsters operating in Britain amid a failure to secure any conviction under existing measures. The “cyber enforcement team” will be set up as part of a Â£4.3m investment by the government over three years to tackle internet and e-mail cons. So it’s now July and ASA Forum is still operating and hundreds of these HYIP, Paid To Click, Auto Surf, Ponzi, etc. scheme websites and programs are still operating. There pretty much is going to have to be an entire govt department set up to monitor this. I can go find hundreds of these sites fairly easily manually. Problem is these are likely to be set up out of the country. The govt needs to go to Google and the Search companies and require them to shut these cos and forums out if they can’t close them down at the IP address. Sure they can keep renaming themselves but that’s all there is to it. I think the search engine that really finds a way to monitor and allow legit companies on a search engine and then advertises it that way and has a system in place to shut these people out (sort of a private business to customer internet) will be the next wave. You figure out a way to certify the businesses and hold them to it and you might have the next big thing.